These Postcard Displays for a Retail Store are Designed for Countertops. These Store Fixture Accessories are a Great Sales Tool for Your Storefront! Each of These Postcard Displays are Clear Acrylic, So Your Merchandise Has the Limelight. 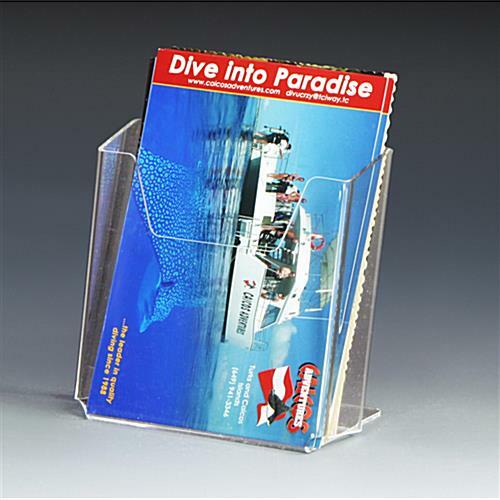 These postcard displays that are acrylic have a single pocket to accommodate 4" x 6" post cards, greeting cards, stickers, photos, brochures and other paper items. These display fixtures are commonly seen at a hotel gift shop, a convenience store, or on the countertops of real estate agencies. These postcard displays are clear acrylic and so the focus stays on the merchandise itself. These card racks set near a cash register will encourage impulse sales! 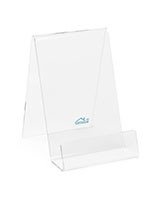 These postcard displays, also known as a store display, are small and compact so they are great for small shops without a lot of counter space. These store fixture units, retail display kiosks are lightweight, and will fit on virtually any counter, even a jam-packed one. 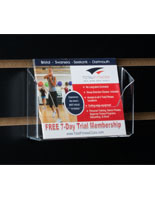 People who like it simple will love these streamlined postcard displays. No extraneous details, rate details, your postcards, greeting cards, brochures, and other printed materials are the main focus of the display. Each of these postcard displays, retail display are great tools to show off your carefully selected merchandise. These fixtures for a store makes your goods more visible and attractive to patrons than if they were simply arranged on a counter. 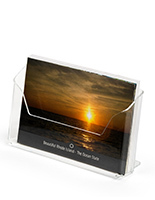 These slanted postcard displays accommodate 4" x 6" cards, photos, or similar sized items. These store fixture units have a strong base that keep them upright. Each of these supports prevents these postcard displays from tipping over. Best of all, these retail display fixtures are low-cost to fit into any retailer's budget! 4.5" x 4.5" x 3.3"
We are unable to accept orders for less than 12 units.